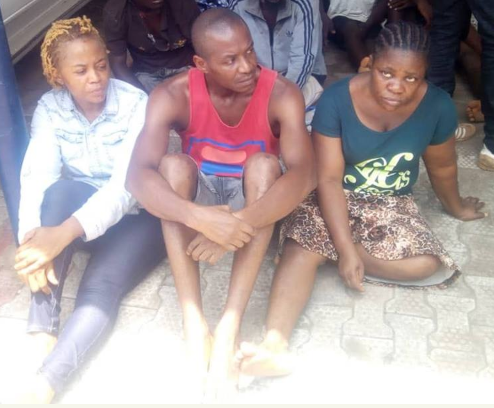 Anambra State Police Command has paraded three suspects (two women and a man) over the viral video of a lady who was disgraced, beaten severally and stripped n*ked. According to the Commissioner of Police, Rabiu Ladodo, the victim was invited by Mr Ifeanyi Azotani, 40 year old artisan, from Ifitedunu, Dunukofia LGA to his house at Amawbia where the alleged wife, Tochukwu, 43 and her niece, Ogochukwu Nwankwo, 33 bumped into them, stripped, beat and later made monetary demands from her. She was also threatened that they will release the video on the internet if she doesn't pay. All the suspects confessed to the crimes but denied releasing the video. They claimed it was a third party that collected the video from them on the day of the incident and released same. The police say necessary action will be taken to arraign them in court to answer for their actions.